Who Says You Can’t Camp in Style? Summer is in full swing with lots of sunshine and many long and warm days. For those of us who are the outdoor types, you may have already gone for your first camping trip over the Canada Day long weekend. If the idea of camping in a tent in the middle of nowhere makes you want to run in the other direction, may I suggest glamping? Glamping – short for glamorous camping – is perfect for those of us who would much rather sleep in a comfortable bed, but wouldn’t mind an experience surrounded by nature. British Columbia is home to a wide selection of glamping options, offering different levels of luxury as well as price-point. 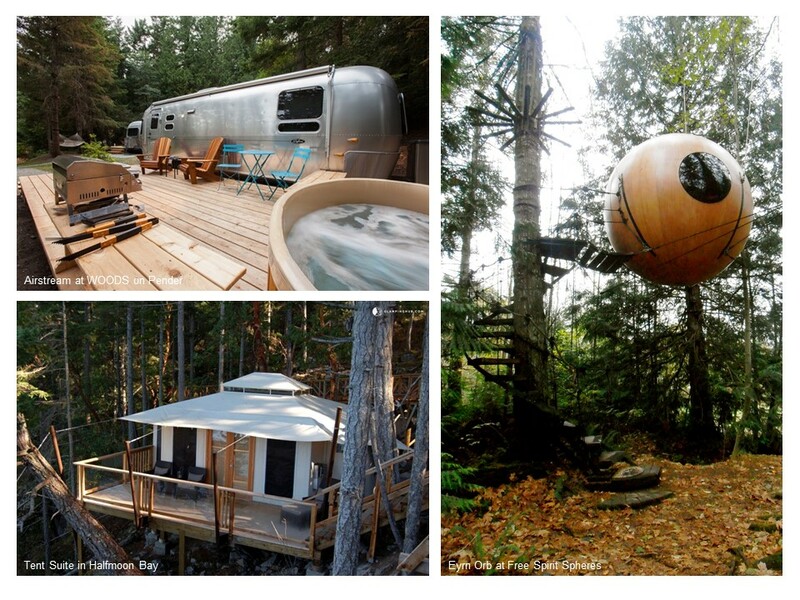 Here are some glamping locations that we would love to visit! On the bucket list of people from all over the world is to stay in one of the three orbs offered by Free Spirit Spheres. Located near Qualicum Beach on Vancouver Island, this little getaway is suspended from treetops in a tranquil rainforest. A treehouse for adults, these orbs offer a magical experience for guests who get an immersive experience amidst a lush green canopy. Although the orbs are small, they are cozy and provide a very comfortable stay. A compostable toilet, showerhouse and sauna are also just steps away, creating a full glamping experience. Looking for a relaxing island getaway with the family without sacrificing wifi, a comfy bed and a hot shower? Then WOODS on Pender Island is perfect for you. You can choose to stay in one of 6 Airstreams, 3 Rustic Cabins, a Shasta Airflyte or one of the 9 Lodge Rooms – each a truly unique stay. You get the camp experience – tranquil with stunning scenery and wildlife – complete with the amenities of a hotel. Accommodations include Beautyrest beds, Apple TV, Towels and luxury toiletries and a hot tub (some even have a private one). If you decide to leave your room, the grounds has the Coffeehouse Restaurant where you can grab some comfort food with a handcrafted cocktail or glass of BC Wine. Adventure a bit further and there are also hammocks, a games room, outdoor recreation areas, fire pits and hiking trails. Who wouldn’t want to spend a few days glamping here? A sanctuary overlooking the Pacific Ocean, these tent suites are purely luxurious. Take in the Sunshine Coast scenery from your private deck or enjoy activities such as yoga, swimming and scuba diving. If you are in for an indulgent experience, there is also an onsite spa. Choose from one of two luxury tent suites which feature a king-size bed, fireplace and heated slate floors. Take a soak in your outdoor tub and take in the breathtaking views from your suite. These tent suites are the ultimate adult getaway in style without the kids. Where would you like to go glamping? Let us know in the comments below.